The $34,000 scholarship will help fund the history of art major's eventual graduate studies. 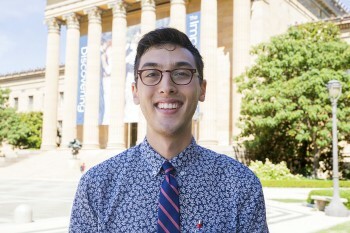 Dylan Kahn '16 has been awarded a Beinecke Scholarship. A program of the Sperry Fund, the Beinecke funds graduate studies in the arts, humanities, or social sciences for students who have demonstrated a superior standard of intellectual ability, scholastic achievement, and personal promise. Kahn, a history of art major who co-manages campus' Cantor Fitzgerald Gallery, will use his scholarship to pursue a course of study in either art history or curatorial studies. He then hopes to work in museum curation or administration. “I studied studio art in high school, and history of art seemed like a good way to develop my interests in a more academic direction,” says Kahn, who is also minoring in French and working towards a concentration in gender and sexuality studies. Since 1975 the Beinecke Scholarship program has selected more than 570 college juniors from more than 100 different undergraduate institutions for support. This year's 20 recipients will receive $4000 immediately prior to entering graduate school and an additional $30,000 while attending graduate school. Kahn, who is originally from Boulder, Colo., found out he had been selected for the scholarship while in Paris during his semester abroad at the Sorbonne's Institute of Art and Archaeology. Kahn is interested in the intersection of European and American art at the turn of the 20th century, and is planning a senior thesis on“Miss M. Carey Thomas,” a portrait of Bryn Mawr College's second president painted by John Singer Sargent. That work, in particular, represents how the Tri-College partnership has enhanced and enabled his academic pursuits: It is a painting the Haverford student previous studied in a Swarthmore course for his Bryn Mawr-based major.